Based in Perth (SCOTLAND, not Western Australia!) ours is mainly a Whitewater kayak club, but members paddle Open (Canadian) Canoes, Slalom Competition K1 & C1, and Sea Kayaks too. We paddle throughout the year (although beginner's trips are generally held in the warmer months) and we train indoors and play Canoe polo through the winter. 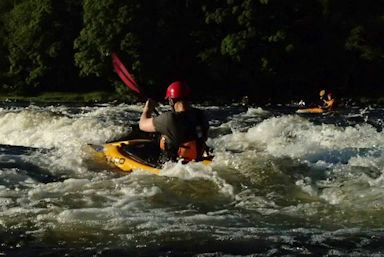 We have a number of experienced paddlers, instructors, and coaches and can support paddlers from their first time afloat right through to advanced level paddling. Our loan equipment stock means you can try paddlesports for free. Club members can often borrow items to get started then buy their own gear a bit at a time. good sources of weather and River Level information. It is not necessary to join the club simply to try out paddlesports, but beyond a taster session or two, we do require you to become a member. For forthcoming events and meetings we use our Facebook page, use the link to Facebook below to see where we go and what we do.